Techne Architects transforms a tired corner pub into a lively Melbourne hub that’s barrels of fun with an all-important beer garden. A good pub is a community asset, and when it is up and humming, it can become a lively hub of neighbourhood activity. This is the concept behind the Prahran Hotel project in Melbourne, and indeed it underpins all the pub projects designed by Techne Architects for the hotel’s umbrella company Sand Hill Road. The design challenge set for Techne was to clothe the fundamentals of a good pub in the right framework, and Techne has drawn on its long and productive relationship with Sand Hill Road to do so with consummate ease. This project is a shining example of what can happen when an architect and a client are creatively “in sync.” At our congenial in-pub lunchtime meeting, Techne architect and director Justin Northrop and Sand Hill Road director Matt Mullins were practically able to finish each other’s sentences. Northrop, who shares the creative kudos for his projects liberally with the client and the entire project team, understands what Sand Hill Road is all about. 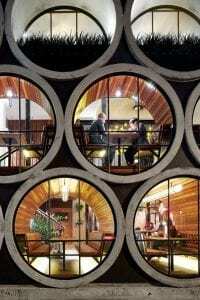 Techne has been the architect of ch oice for the company’s pub projects from its earliest days. The problem Techne addresses on behalf of Sand Hill Road is clearly defined. Sand Hill Road takes on pubs that are, as Mullins says, “broken.” They are typically pubs in pretty good locations in relation to their feeder communities, but ripe for reinvigoration; they are tired and in need of love. The love that the pubs receive is in the form of a renewed sense of purpose, and a renewed attention to the fundamentals: good social spaces; great atmosphere; a lively front bar giving way to more nuanced spaces in a circuit; and a sense of theatre, friendly voyeurism and compressed activity. Top this off with a beer garden in the best tradition of the “local” and you have the recipe for a great place to spend your time imbibing the amber fluid. Techne was able to keep the Prahran Hotel operational throughout the build, which was essential to keeping local community support. Patrons were able to keep track of the works going on at the rear, where the majority of the building occurred, through a large glass window. In this way the story of the pub’s renewal was given a visual narrative. The project is divided pretty cleanly into a front and a rear portion, respectively the old and new spaces of the pub. In the original rooms, the approach has been to build on the existing character, and some interior detailing explicitly riffs on the late art deco language of the old hotel. Downstairs, the front bar has been partly divided by screens, adding to the experience of “not seeing it all at once,” which Mullins believes is essential to the social drama of a good pub visit. The front bar is the first port of call; both architect and publican like visitors to enter a front bar and have to negotiate a pleasant crush of people as the first experience of a venue. Nevertheless, the new wing is visible from first arrival as a large volume opening out of the rear of the old hotel, beckoning the visitor onward. The new portion is where the designers were able to take wing. Mullins explained that when Sand Hill Road commences a new project with Techne, the process does not start with the question of how it is going to look. Northrop was also clear on this point: he detailed how, as his practice has matured, aesthetics have taken a subordinate b ut nonetheless important role in the development of its projects. In the case of the pub projects, aesthetics has to be secondary to the assemblage of the key elements of a “good” pub experience. Get that right, and everything else falls into place. But as Mullins made clear, while the question of form and aesthetics might not be the starting point, Techne invariably arrives at a dramatic and bold answer that addresses it deftly. 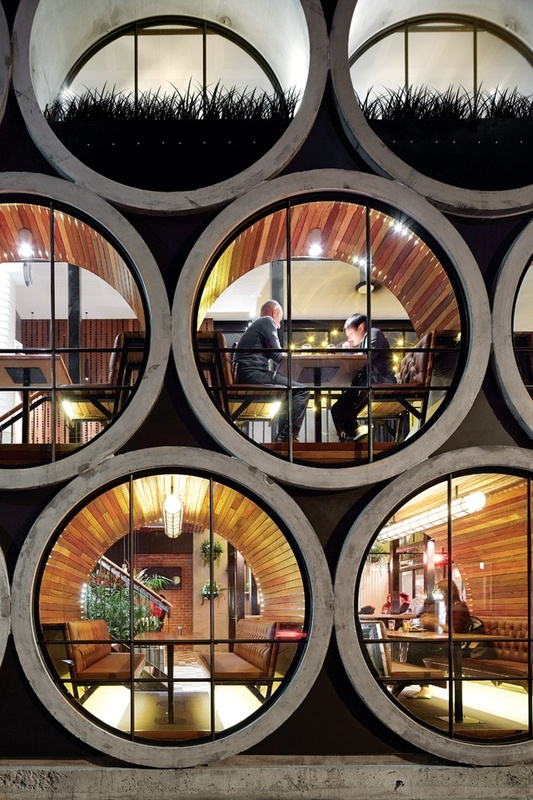 At the Prahran Hotel, the answer came in the form of a facade composed of enormous industrial concrete pipes big enough to contain seating booths. The concrete pipes are stacked vertically like an oversized wine rack and make a dramatic visual statement on both the interior and exterior. Internally, another enormous pipe, this time cut in half and suspended on steel legs, creates a cradling mezzanine platform for more dining tables. A generous and, importantly, highly visible stair links the lower and upper levels, drawing patrons up through the high space and back into the upper storey of the old hotel, where another long bar is located.